This dungeon section is a module in the truest sense: designed to be placed “in the characters’ path if they travel down a corridor that you have not yet detailed”, it slots into megadungeons as easily as it could become a single one-night scenario. In 12 pages, it outlines a compact 25-entry encounter area built by an evil cult, and now inhabited by a cursed monster who had once been the cult’s implacable foe. Meant for the Dungeon Crawl Classics RPG, it converts easily to your preferred D&D variant or edition, and has good production values. There is a very lurid, in-your-face sense of the grotesque in the DCC role-playing game, and Bone Hoard follows this style very faithfully. Its rooms and passages are inhabited by the results of playing with bizarre magical forces, and the various creatures, objects and even magic items come across as strange and unwholesome. Where else but here could you find “a golden coloured bladder of some unknown substance, extracted from some creature from another plane of existence”, and let that be your reward for being an adventurer? Where else will you face the equivalent of giant rats – but boneless and equipped with leech-like mouths? Of course, there is a fine line to walk between horrid and laughable, but I believe this module walks it. The strangeness of the location and its various horrors is not just a set of descriptions that use Lovecraftian imagery, but also has in-game relevance; the set-pieces are interactive and allow interesting experimentation, even if the approach to the encounter area is mostly static. Sometimes, the room descriptions and GM instructions overstate the obvious, or present vital information in so much detail that it becomes unwieldy (especially if it is dropped into a game without preparation, one of its intended uses). Occasionally, difficulty checks are given for trivially easy tasks, and treasure values are listed for non-valuables like “horn spoons worth 2 cp each”. This is more trouble than worth, although to the author’s credit, it is much more interesting to find horn spoons than yet another set of generic jewellery worth 300 gp. There are a few empty rooms filled with rubble too many. Some careful editing would have done this product good – it is a good 6 page scenario in twice as many pages. Make no mistake: this is solid, playtested, utilitarian material, a module (component) with a lot of imagination. We need more adventures like this. 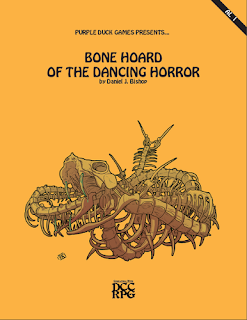 Although designed for its specific assumptions, it remains easy to use outside the context of the DCC RPG, and its weirdness is perhaps even more enhanced. Good analysis. I used this in the opening of a campaign 53 sessions ago, and it helped set the tone for adventures inthe world, that this was not going to be a series of encounters with the standard cast. The group had fun and ran for their lives a few times.